The GoldXpert is a stylish countertop analyzer fit for the consumer showroom environment. Designed to be compact and lightweight, weighing only 22 lbs (10kg), the GoldXpert can be transported easily to wherever testing is needed. The GoldXpert gives accurate chemistry and karat results within seconds. XRF is a widely used, proven, and accepted method of chemistry analysis and determination of purity and fineness of precious metals. XRF analysis is a multielemental testing alternative that is quicker and less expensive than fire assay and chemical tests. XRF provides on-the-spot analysis of your silver, platinum, and PGM metals and impurities, making it an easy way to boost customer confidence and ensure dealer reliability. Given the current high value of gold, quantifying its fineness and purity is more critical than ever. Whether you buy gold, sell or produce jewelry, fabricate metal, or recycle scrap metal, you need a fast, highly accurate method to determine karatage (gold content) for quality control and pricing. The Innov-X GoldXpert XRF analyzer is an easy-to‑use, cost-effective method to obtain alloy chemistry and karat classification with one nondestructive and nonintrusive test. Additionally, an exclusive GoldXpert software feature helps identify gold-plated objects and sends an alert to the screen. The GoldXpert is designed to be compact, taking up minimal countertop space. An attractive design suitable for the showroom floor. An easy-to-use analyzer providing karat and compositional analysis results with one push of a button. Accurate chemistry and karat results within seconds. Quickly and easily create result certificates (with optional PC software). Testing chamber window and interior enabling continuous sample viewing for utmost customer security. Optional battery for on-the-road testing when you take the GoldXpert along with you during visits to customers and vendors. The GoldXpert can be networked for easy access to testing results as they are being generated. The analyzer is a safe and secure closed-beam system that requires minimal training (varies by country). The GoldXpert offers the best of both worlds. A handsome countertop analyzer fit for the consumer showroom environment, it can also be networked for high productivity QA/QC jobs. The large chamber door opens quickly with a push of the large front trigger. The GoldXpert can also function as a portable analyzer when powered by a rechargeable Liion battery pack. Compact and lightweight, and weighing in at only 22 lb (10 kg), the GoldXpert can be transported easily to any location where testing is needed. Detector system available for optimized precision on trace elements. The GoldXpert comes equipped with an integrated CMOS camera, which records sample images to memory along with analysis results for report generation. The X-ray beam collimation is utilized for measurement of small components and samples. A simple tap on the touch screen in camera view activates the 3 mm diameter collimation, and an on-screen indicator shows the operator exactly where the analysis spot is focused. Collimation can be easily reverted to a 10 mm diameter for standard bulk analysis. The GoldXpert has an exclusive feature that detects possible gold plating or coating when screening gold pieces. The GoldXpert analyzes for this possibility concurrently with composition of the piece. This feature allows the GoldXpert to alert the user if it determines that there is a possibility of gold coating or plating. Data can be exported easily to spreadsheet format, and the memory can be accessed remotely when the GoldXpert is networked via its Windows CE operating system. Customized result and reporting certificates, including analytical results, an image of the tested sample, the company logo, and more, can be generated via the optional PC Software with the click of a button. The GoldXpert XRF analyzer is ideal for pawn shops, cash-for-gold operations, the jewelry industry, museums, archaeological sites, coin collectors, scrap recycling, and more. Powerful 4 W X-ray tube provides reliable and accurate analytical performance. Speed: Delivers fast results within seconds. Portability: Can be powered by a compact battery for on-the-road analysis. Easy and accurate measurement automatically adjusts for the shape and size of the sample. Large data storage capacity for test archiving. Easy data export and reporting for immediate certification generation. On-the-spot gold karat classification, 0-24 kt. 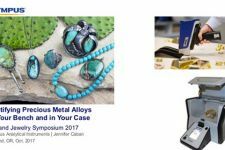 Accurate compositional analysis of platinum, silver, and other precious alloys. Verification of gold content in scrap metal. Determination of gold and silver content in coinage. The GoldXpert is equipped with an articulating sample holder arm, for securing and oriented samples for analysis. 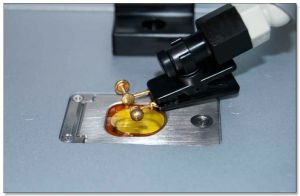 The Sample Holder is ideal for small component and mixed-metal jewelry testing. The GoldXpert is available in two configurations: the standard GoldXpert and the high-performance GoldXpert SDD. The GoldXpert SDD is equipped with an advanced Silicon Drift Detector, enabling better precision and sensitivity for the most critical of applications. The GoldXpert SDD offers a two-fold improvement in precision and sensitivity over the GoldXpert. For example, for a 20-second long test on an 18 kt gold standard, the GoldXpert will yield an Au precision of ±0.125%, while the GoldXpert SDD will yield an Au precision of ±0.067%. Longer testing times provide better precision. Shorter testing times can be utilized for rough, approximate analysis. The GoldXpert SDD is recommended for refiners who need the utmost in analytical precision and fast reading times. The standard GoldXpert is suggested for general karating and trading applications.